Notes: *Subspecies not recognized by some taxonomic authorities (Barthelmess 2006; Happold 2013). Body robust; heavy build. Head rounded. Eyes and ears small. Middle and rear upperbody covered in bristly hairs, long spines, and defensive quills. Quills are not barbed. Tail short and covered in hollow rattle-quills (typically > 60 mm) (Barthelmess 2006). Rump covered in short spines that lay flat against body (Skinner and Chimimba 2005). Crest of long hair from top of head to top of shoulders. Legs relatively short (Barthelmess 2006, 2016b). Claws thick (for digging) (Pillay et al. 2015). Facial whiskers long (Skinner and Chimimba 2005). Overall, dark brown to black (de Graff 1981). Quills banded black and white (warning coloration) (Barthelmess 2006, 2016a). Where spines and quills not present, hair is black, grayish, or brownish (except crest, which is commonly has white tips). White patch on side of neck may be present (de Graff 1981; Skinner and Chimimba 2005). Found in most vegetation types of southern Africa: savanna grassland, brushland, acacia and miombo woodlands, semi-arid deserts, and margins of lowland and montane tropical forests (Skinner and Chimimba 2005; Barthelmess 2016b; Cassola 2016). Common in rocky hills (de Graff 1981). Adapts well to agricultural areas (Pillay et al. 2015). 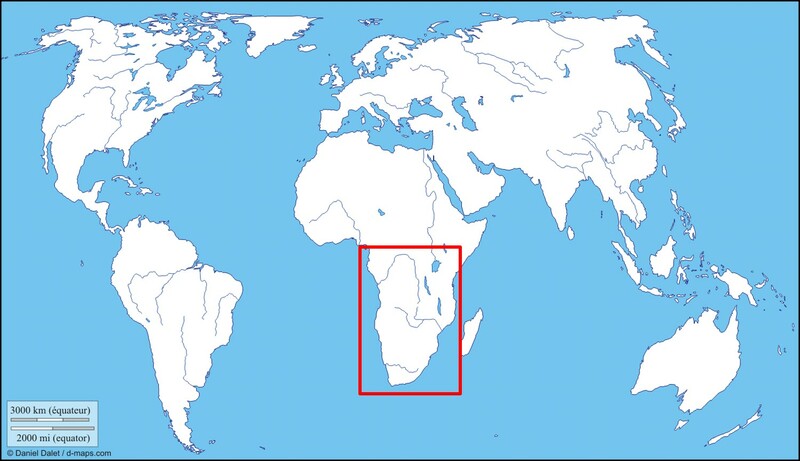 Sea level to about 2,000 m (7,000 ft) (Skinner and Chimimba 2005; Barthelmess 2006). No scientific estimates. Considered fairly common. Population trend: stable (Cassola 2016). No major threats. Hunted for their meat and quills (Barthelmess 2006, 2016b; Cassola 2016). Nocturnal (de Graff 1981; Corbet 1991). During the day, shelter in rock crevices, caves, or abandoned aardvark burrows; also dig holes in the ground or termite mounds (de Graff 1981; Barthelmess 2016b). Sometimes observed sunbathing near shelter entrance (Skinner and Chimimba 2005). Adult male–female pair spends most time within a small territory at the core of a larger, non-defended home range. Pair defends territory, which shifts in size and location over time and from season to season (van Aarde 1998; Corbet 1991; Skinner and Chimimba 2005; Barthelmess 2016b). Offspring often disperse when mature but may stay with family group, if dispersal opportunities are limited (typically when competing for space and food in high-density populations) (Corbet 1991). Live in family group comprised of an adult breeding pair, and subadult and juvenile offspring. Reported group sizes range from 2 to a maximum of 14 individuals (de Graff 1981; Corbet 1991; Barthelmess 2016b). Forage at night, singly or near each other in a small group: parent–offspring groups or adult pairs (possible mate guarding) (van Aarde 1987; Barthelmess 2016b). Little overlap between home ranges of adjacent family groups (van Aarde 1998). Located about 2 m (6 ft) underground. Extensive passageways and multiple exits. Main tunnels can be 20 m (60 ft) long. Family group uses several burrows within home range (de Graff 1981; Barthelmess 2006; Happold 2013; Barthelmess 2016b). Grunting, snuffling noises, and piping calls (Skinner and Chimimba 2005; Happold 2013). Adult pairs have daily bonding behaviors, such as mutual grooming (Corbet 1991). Warning display includes feet stamping, raising quills, and shaking rattle-quills on tail (Barthelmess 2016b). Well-developed sense of smell; scent mark feeding areas (de Villiers et al. 1994; Barthelmess 2016a, 2016b). Bulbs, roots, shoots, root vegetables (e.g., potatoes, carrots), groundnuts, fruits, stems, and tree bark. May occasionally eat carrion. Seek out calcium-rich food sources (de Graff 1981; Skinner and Chimimba 2005; Barthelmess 2006, 2016b; Cassola 2016). Forage above the ground (Happold 2013). Also hunted by humans for their meat and quills (Barthelmess 2016b). Slow, shuffling walk. Can run quickly, when necessary. Capable diggers (Skinner and Chimimba 2005; Happold 2013). No climbing or jumping abilities (de Graff 1981). Considered a pest by farmers in some areas of Africa; eat crops, such as melon, pumpkin, root vegetables, and maize. Caught and killed by some farmers. Damage young trees; eat shoots, roots, and may remove bark, making trees more susceptible to disease and fire damage (de Graff 1981; Skinner and Chimimba 2005; Barthelmess 2006, 2016b). Help to reduce populations of bulbs that are poisonous to cattle (Homeria spp. ); help keep acacia growth in check (de Graff 1981). In a family group, only the dominant female in the adult pair conceives (reproduction suppressed in subadult females). Breeding season varies by location. Most young born August to March (peak in January) [obs. managed care; van Aarde 1985], during summer rainy period. Reproductive behavior occurs throughout the year (may reinforce pair bond) (van Aarde 1985; Morris and van Aarde 1985; van Aarde and Skinner 1986a, 1986b; van Aarde and van Wyk 1991; Happold 2013; Barthelmess 2016b). Both parents care for offspring. Mother suckles young almost continuously the first two weeks; then, more intermittently up to 20 weeks of age (van Aarde 1985). Father defends territory, protects young, grooms young, and chaperones young on foraging trips (van Aarde 1998; Barthelmess 2016b). In burrow den, young huddle with family members for warmth (Corbet 1991; Barthelmess 2016b). Young remain in burrow for 7 to 9 weeks; emerge when quills have hardened (Happold 2013). Newborns and juveniles have high survivorship (Barthelmess 2006). Females: 12 to 14 months (Barthelmess 2016b); may be earlier in managed care (van Aarde 1985). First conception typically occurs during second year (van Aarde 1985). Lactation period: about 100 days, on average (range: 37 to 163 days) [obs. managed care] (van Aarde 1985). Young begin eating solid food at about 4 weeks (sometimes earlier) (Skinner and Chimimba 2005). Begin feeding independently at 5 months old (van Aarde 1987). One of Africa’s 2 largest rodents (the other is the crested porcupine, Hystrix cristata) (Barthelmess 2016b). If threatened, may become aggressive and move quickly towards perceived aggressor (e.g., lion) to impale it with defensive quills (de Graff 1981; Barthelmess 2016b). When not removed, quills can move deeper into flesh and cause painful, infected wounds (de Graff 1981). Cape porcupine considered an ecosystem engineer because of its foraging habits. Dig holes that open up soil surface, allowing water to seep into ground and new plants to grow (Bragg et al. 2005; Barthelmess 2016b). For bibliography, click the tab at the top of this page. 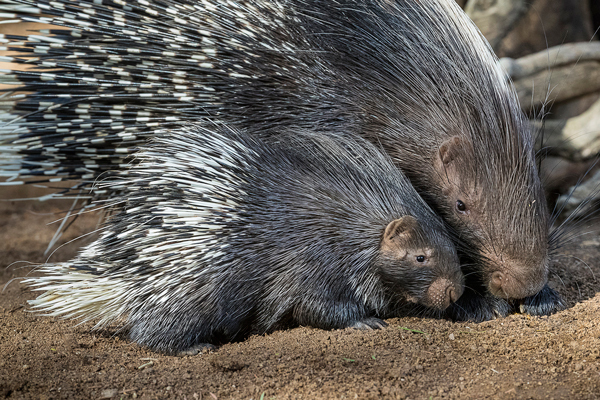 How to cite: Cape Porcupine (Hystrix africaeaustralis) Fact Sheet. c2019. San Diego (CA): San Diego Zoo Global; [accessed YYYY Mmm dd]. http://ielc.libguides.com/sdzg/factsheets/cape-porcupine. Cape porcupines have a large distribution, ranging across the southern half of Africa. Adapted from www.d-maps.com according to IUCN fact sheet. Click here or on map for detailed distribution (IUCN).